CALLA, the common acute lymphoblastic leukemia antigen, is a 100 kilodalton cell surface glycoprotein which is expressed on approximately 80% of leukemic cells from patients with non T-cell acute lymphoblastic leukemia and 40% of patients with chronic myelogenous leukemia in blast crisis (1,2). In addition, CALLA is expressed by tumor cells from most patients with nodular poorly differentiated lymphocytic lymphoma and Burkitt’s lymphoma, and approximately 40% of T-cell lymphoblastic lymphoma (3). In normal bone marrow, approximately 1% of mononuclear cells express CALLA, but regenerating and fetal marrow express a slightly higher percentage. CALLA is also expressed by other tissues including terminally differentiated granulocytes, renal glomerular cells, cells of the proximal renal tubule and cultured fibroblasts, making the in vivo use of the monoclonal antibody directed against CALLA less effective or dangerous as compared to the in vitro treatment of bone marrow. 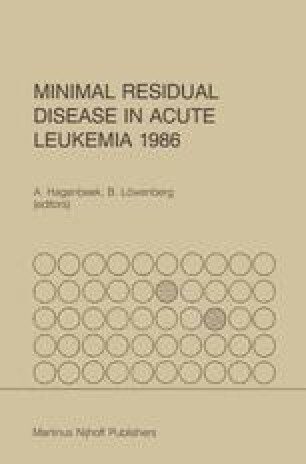 The monoclonal antibody directed against CALLA is termed J5, is of the murine IgG2A class, and identifies a subset of patients with a relatively good prognosis as compared to non T-cell ALL patients who do not bear CALLA antigen on the surface of their leukemia cells.